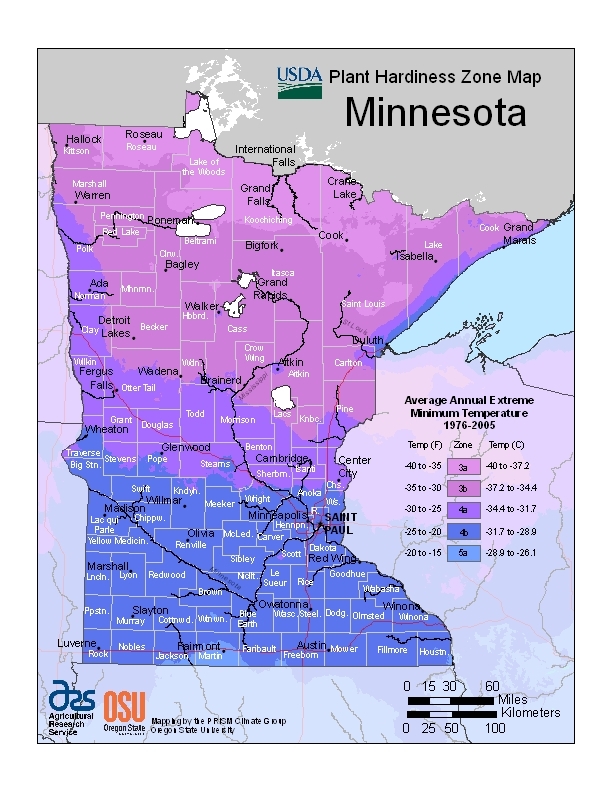 A sliver of Minnesota is officially in USDA Zone 5, according to the new hardiness zone map released today by the USDA, the first update to the map since 1990. Beyond that corner of Jackson and Martin Counties going officially zone 5 (a place where the lowest winter temperatures don’t sink below -20 degrees F — like say, Chicago), a huge chunk of Minnesota is now rated zone 4b (lowest temp: -25) and the area around St. Cloud has shifted from borderline zone 3 to a firm zone 4a — break out the Japanese maples! According to the USDA, the changes in zones are the result of several factors. Mapping techniques are much better than in 1990, allowing for finer distinctions. For the first time, cities with urban heat islands may show up a zone or half-zone warmer than in the past — though not the Twin Cities. USDA also had access to more accurate data and more data because it has more weather stations checking in with information. This map also is based on 30 years of weather information (1976-2005) rather than the 12 years (1974-1986) used for the 1990 map. This smooths out the weather fluctuations plants experience and gives a more accurate picture of growing conditions, according to USDA. For instance, mountainous regions may now be rated colder because the new data takes altitude into account more accurately. The fact that about half the U.S. is a half zone warmer than in the previous map certainly brings up the issue of climate change. The USDA takes a cautious approach, noting that this map may merely be more accurate than previous maps and that climate change shows itself over even longer stretches of time (50 to 100 years). The USDA has a very informative website about the new map, which allows folks to input their zip code to get very detailed information. Darn it, I was hoping we’d be upgraded to zone 6 after the winter we’ve had so far here in Minneapolis! 🙂 Thanks for posting this. Amy — I don’t think we have been lower than -5 or at the most -10 so far this winter, which is about zone 6 — so who knows! And, there’s a sliver of the metro area (my house!) that’s also Zone 5. I’m also thinking that a white, south facing wall means that garden IS Zone 6! Hrumpf! I wonder if the USDA took global warming into account? i live in zone 4b anoka county minn.sent a e-mail to raintree nursery inquiring about buying kansas sweet,and kristin cherry trees they say will grow in zone 4.they sent me a e-mail back saying that they could not recomend that type of cherries do to minn.hardiness charts.what’s up with that,are minn. hardiness charts wrong. Bill — It might be that the zone map is fine, but the zone recommendations for this plant are off. You might want to ask a local nursery this spring. I have not heard of anyone planting either of those varieties in Minnesota and generally sweet cherries do not grow well here. A good replacement for Kansas Sweet might be Bali cherry, which is also a sweetish tart cherry and grows like gangbusters in Minnesota. I’m intrigued by the description of the Kristin cherry — may try to find one — but have not heard of anyone planting them. Can anyone recommend a good dwarf pear tree that can survive Mn zone 4b? The USDA looks at past data, so it’s reflecting whatever climate change may have already occurred. Thanks for commenting!